Here are the various options for you to submit/upload your best image/s and stand a chance at being featured in the next Picture This Magazine. Note: If you are not a member, you will be asked to join the network. After your have become a member, go to www.onesmallseed.net/m on your iOS or android phone. 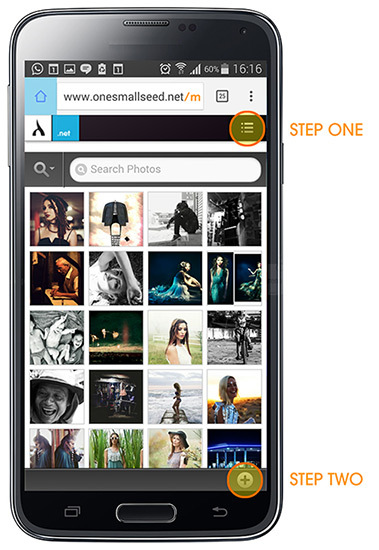 Follow the steps in the image and find your best photo and upload! Please be patient as it might take a few seconds for your image to show. Submit via email HERE (picturethismag[at]gmail[dot]com) note: if you are sending a selection of high res images please use sendspace.com or WeTransfer.com. Like the Picture This Magazine Facebook Page and tag the page in your best photos you upload/share to Facebook. You can also send a message with your submission/s.